Anne Rice‘s birth name is unusual. She was born Howard Allen O’Brien. The date of birth is 1941 and she is from New Orleans, Louisiana. Her birth name was given to her by her mother. This was because her father was named Howard and she thought it was a strong name that would give her an advantage in the world. She later adopted the name Anne in first grade. Rice is known for her vampire tales. She has sold more than 100 million copies of her books. They are still to this day selling like hot cakes. Rice is famous for her books including “Interview with the Vampire”, “The Witching Hour” and “Blackwood Farm”. 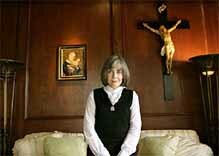 Anne Rice is 67 years old. Rice experienced many symptoms that she could not explain. These included a writer’s block, indigestion after every meal and weight loss. Rice ignored the symptoms and continued to work as normal. In 1998, Rice went into a coma. Doctors found that she had a blood sugar level of 800. Rice then joined the other celebrities who had been diagnosed as having type 1 diabetes. After this episode, she began speaking out for the awareness of diabetes.